The seven-hour drive from Bumthang to Mongar takes you through one of the most spectacular roads of Bhutan. The road goes over 4,000m Thrumshingla pass, the highest motorable pass in the country, through roads carved into vertical cliffs, spectacular waterfalls and lush vegetation. You will notice immediate change in landscape from the country you leave; the east is more rugged and habitats cling on to steep slopes high above the valley. There are very few broad river valleys in the east. It is a new dzong established in 1930 after losing the original, situated down in the valley, to fire. The ruins of Shongar can be seen from the road before you ascend to the new location. Although it is relatively new, it was still built in the traditional method without blue print or iron nails. It is a testimony to continuing tradition of the past. 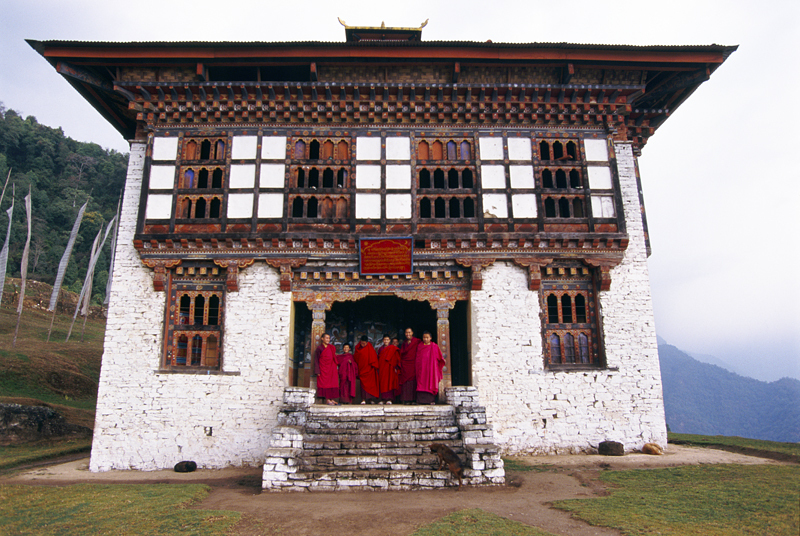 Drametse monastery was founded by Ani Choten Zangmo, Pema Lingpa’s granddaughter, who fled from Bumthang to escape a proposal of marriage from the local king. She fled east and when she found a place ideally suited for meditation and practice she named it ‘Drametse’ which literally means ‘the peak where there are no enemies’. Ani Choeten Zangmo’s kudung (remains) is preserved to this day in the monastery as the most important relic. Further, Drametse was blessed by the birth of three successive incarnations of the Zhabdrung: Jigme Drakpa (1791-1830), Jigme Norbu (1831-1861), and Jigme Chogyel (1862-1904). Many religious festivals with sacred masked dances are performed every year. Out of the many masked dances, theDrametse Ngacham (Drum dance of Drametse) is the most popular and well known in the country. It is said that Lama Kunga Gyaltshen, brother of Ani Choeten Zangmo, in a visionary state reached Zangdo Pelri (the Paradise) of Guru Rinpoche where he witnessed the performance of this dance. Upon his return to the human realm, he introduced the tradition of this dance in Drametse and later it spread widely and was known as theDrametse Ngacham. Other masked dances include the sacred dances known as the Peling Tercham or the Treasure Dances of Terton Pema Lingpa, which are only performed during these festivals. These dances include Peling Gingchenand Rujen performed during the burnt offering (Jinseg) as well as Shagpadre, Tseumara and Serdra Chham. These dances are to be viewed as a pure display of Mandalas representing particular deities or psychic forces. The function of the dance, both for the dancers and the spectators is one of liberating from ordinary thoughts and emotions. The essence of these masked dances is therefore to bring about inner realization. It is generally acknowledged that most of Tantric ritual dances locally known as Tercham performed in most of the festivals in Bhutan originated from Drametse. The sacred dances are perceived as special gift to the lay community as these dances depict the visionary experiences of profound realization by the sublime beings such as Terton Pema Lingpa. Drametse is therefore the main seat of Pema Lingpa lineage and also the religious and cultural center in eastern Bhutan. Another account attributes the Dzong’s downfall to fire in the late 1880s during the tenure of an eccentricDzongpon called Namela from Drametse. At that time, the Dzong is said to be infested by rodents and fleas that not only harmed animals, but humans too. On seeking suggestions from his attendants to rid the Dzong of rodents and fleas, they suggested burning the Dzong down. So the eccentric Dzongpon set the Dzong on fire.